Justin Harris named valedictorian, Audrey Jordan named salutatorian. 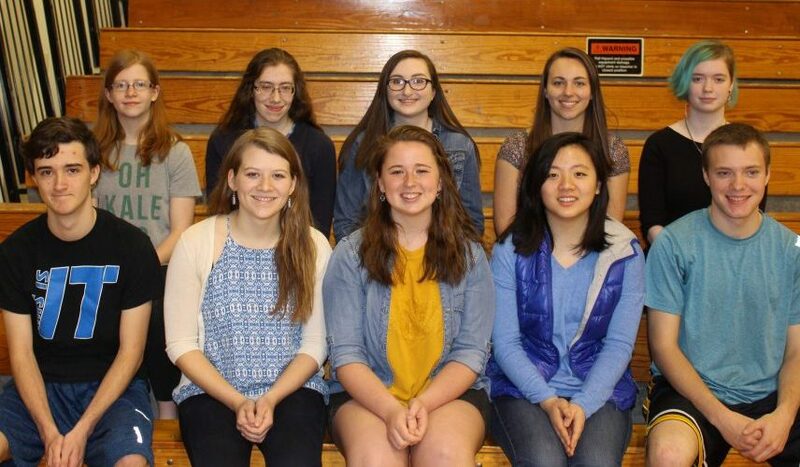 SOUTH CHINA — Erskine Academy recently announced the following students are the top 10 seniors for the class of 2017. The students are listed by rank. Justin Harris, son of Althea and Steve Harris, of China, is valedictorian. Throughout his four years at Erskine, he participated in the math team, the EA Leadership Team and cross country. He received awards of excellence in the areas of algebra 2, precalculus, calculus and physics, as well as the Rensselaer Award. He was selected as a Renaissance Senior of the Trimester. Harris plans to attend the University of Maine to study engineering. Audrey Jordan, daughter of Julia and Douglas Jordan, of Whitefield, is salutatorian. A member of National Honor Society, she participated in the Friends of Rachel Club, the EA Leadership Team, the HOPE Club, field hockey, lacrosse, swim team and she served as a class officer. In addition, she completed more than 235 hours of community service projects. Jordan is a Maine Principal’s Association Award recipient, received awards of excellence in the areas of algebra 1, algebra 2, chemistry and Latin. She was the recipient of the Society of Women Engineers Award. Jordan plans to attend Bowdoin College to major in neuroscience. Hannah Burns, daughter of Dolly and Dan Burns, of Whitefield, is third in academic standing. She is a member of National Honor Society and participated in Student Council, EA Theater Club, Friends of Rachel Club, the EA Leadership Team, HOPE Club, field hockey, basketball, softball, lacrosse and has completed more than 335 hours of community service projects. Burns was a recipient of the Smith College Book Award, received Renaissance Recognition and Senior of the Trimester awards, and she was the recipient of awards of excellence in integrated science, biology, English, social studies, physical education and health. Burns plans to attend the University of Maine to major in bioengineering. Jessica Zhang, daughter of Judy and James Zhang, of China, is fourth in academic standing. She is a member of National Honor Society and she participated in the math team, robotics, speech team, debate team, swim team and tennis. In addition, she completed more than 300 hours of community service projects and she has received awards of excellence in English and Chinese. Zhang plans to attend the University of Rochester to pursue studies in mechanical engineering. Seth Allen, son of Sally Allen, of Windsor, is fifth in academic standing. His extra-curricular involvement included Student Council, cross country and wrestling. He was a recipient of the Bausch & Lomb Honorary Science Award and he has received awards for excellence in Russian, precalculus, and U.S. history. Allen plans to specialize in airbone linguistics in the Air Force. Veronica Black, daughter of Debbie Hyler, of China, and Norman Black, of China, is sixth in academic standing. She is a member of National Honor Society and participated in TLC (Erskine’s community service organization), HOPE Club, Youth in Government, cross country, indoor track and swim team. She completed several community service projects and she has received a Renaissance Recognition award. Black plans to attend the University of Maine to major in biology. Beth Bowring, daughter of Cheryl and Kenneth Bowring, of Vassalboro, is seventh in academic standing. She participated in the math team, was the recipient of the Phi Beta Kappa Award, and received awards for excellence in English, precalculus and Latin. Bowring plans to major in animal behavior at the University of New England. Emma Cote, daughter of Robert Cote, of China, and Bethany Cote, of Windsor, is eighth in academic standing. She was a member of the speech team and has received an award for excellence in geometry. Cote plans to attend Thomas College to major in psychology. Keeley Gomes, daughter of Leslie and Matthew Gomes, of Whitefield, is ninth in academic standing. She is a member of National Honor Society, participated in EA Theater Club, HOPE Club, field hockey, basketball, track and field, and lacrosse. In addition, Gomes completed more than 200 hours of community service projects. She was the recipient of a Renaissance Recognition award and she received awards of excellence in drawing and clay. Gomes plans to major in biology and animal sciences at the University of Maine. Morgan Savage, daughter of Laura and Chris Savage, of China, is 10th in academic standing. She participated in TLC (Erskine’s community service organization). Savage plans to take a gap year.